The Deadly Sin Of Reification Strikes Again! If you can’t see the tweet, and tweets are ephemeral, the screen shot is also given. Now I do not give a damn about the election, so please not one word about it. The point I want to make has nothing whatsoever to do with Trump, Cruz, Hillary, anybody. Is Wilson right? Of course not. But why might Wilson have thought he was? Because of The Deadly Sin Of Reification, which has claimed another victim. Look at the data! The “unfavs” had indeed gone down, just like (presumably) Trump claimed. They were up one survey period before, and they went down in the last one. Up, then down. Therefore down. What could be clearer than that? I also do not give a fig about the survey results. All surveys are “scientific”, anyway, despite the claims you have heard. It does not matter to us, here at least, where the numbers came from, how they were measured, or their uncertainty, which must be at least non-zero and is probably healthy, nor do I care what the terms mean (just what is “unfavorable”?). To us, as to Wilson, the data is the data. See that red line (and grey line)? You’re not alone. That’s all, or mostly all, people do see. The data disappears in the presence of this mesmerizing fiction. The model becomes more important than reality. Reality is tossed overboard and the line cherished. The data are boring, dry observations. The model is scientific! The Sin is gnosticism, where “what is really going on” is the true reality, not reality itself. Wilson was so enraptured by the line that he failed to see what was before him. No, it isn’t. Mistaking the “trend” for what actually happened is the Deadly Sin. This Sin is ubiquitous. It’s so common that it’s positively rare to see a graph (or its interpretation) that doesn’t fall prey to it. Look at any of your favorite global warming sites for examples (skeptic or lunatic); almost anywhere there is a “time series” you will see the Sin. Graphs without the Sin are as common as reactionaries in History Departments. I joined Statistics / To see the Sights / And what did I see? / I saw the Sin. We have talked about trends until my knuckles bled. There is no trend in the data; there is never a trend in any data. Something, actually, many, many, countlessly many things, caused each survey point to take the value it did. The cause is in the people answering the question. Events which were noticed by the people and which led them to give the answers they did are in the world, and in other people. But there is no trend “in” the data. The data are just measurements. What we’re really interested in, in this or any time series graph, is what caused the measurements. In sociological graphs, everybody will pretend they know (of course, it is not impossible that some soul might know) what caused the measurements. In physical graphs, usually many physical forces will cause the measurements; and with physics, we sometimes have a reasonable chance to discover these causes. Probability & Statistics is useful for only one thing: to quantify the uncertainty in propositions we cannot induce or deduce. “The value of Trump’s unfavorable in the next survey will be 60%” and the like can be given a probability conditional on certain evidence and assumptions (the probability will change with different evidence or different assumptions). That’s it. In cases like this, that model (red line) might, or might not, be useful. Probability cannot tell us what caused the measurements. This is why the red line is useless, and even harmful, absent predictions. This is why hypothesis testing (using p-values or Bayes factors) should never be used, because they fool you into thinking you’ve understood cause. But if we knew the causes, we don’t need probability! I have tried explaining the Deadly Sin of Reification many times. The more formal math or statistics education a person has, or the more they’ve seen modern graphs, the more difficult it is for them to comprehend the Sin. I get nothing but blank stares, usually. Professors are especially suspicious. They’re hesitant to dismiss the data, but they’re sure their models mean something. Now I do not give a damn about the election, so please not one word about it. That bad huh? My condolences. I hope in 4 years you get to have better choices. How about, “overall, Trump’s unfavourable rating appears to be going up”? Nope. If you want to say what happened, say what happened. There is no “appears” about it. “There have been more increases than decreases since X”, “It’s up since X”, “Based on the past, I’m guessing it continues to increase”, etc. Luis: That’s more than one word. Trouble following instructions? When I took probablility and statistics for psych majors (not to be confused with calculus based stats for math and science majors, which I also took), it was made clear that the “trend” applied to the experiment or survey at hand, and could be extrapolated only with the greatest of caution. Larger surveys had slightly larger extrapolation limits. What was measured was the “probability” of the outcome. Trends were not reality at that point. If there’s ever a question of trends not being reality, try predicting the trend in the stock market, in women’s fashions, etc. The trend lines are straight in one direction, the data looks like a roller coaster. Worthless for prediciton or causality. Rick the bald could have just left the dots off the graph. No one would’ve been any the wiser. Is it permissible to say there’s a “trend” in the model of the data? If the term “model of the data” isn’t precise enough, then elaborate as required. You could, but why would you want to? Why not just say what happened? The only reason to refer to the model is if you want to make predictions. This conclusions holds for all data, not only this picture. Wilson presented the Huff. Post “Donald Trump Favorable Rating.” That consists of specific poll results plotted over time for both favorable and unfavorable polls, and, an average of those polls is presented. It is to this average that Wilson was referring (we can be certain of this because he presented the image from Huff Post). If we look at the values we find that from one poll to the next Trump’s unfav rating dropped from 65% to 61% — in Trump’s world this IS a decline. To go with Briggs’ nitpicky semantics gamesmanship, this IS a decline as 61% is lower than 65%. Trump (presuming Wilson’s quote/paraphrasing is correct) could arguably be correct because we can find, elsewhere in Huff Post, that the margin of error is about 3% (or a bit less) in these polls. So a four-ish percent drop may be “statistically significant.” We could expect Trump to make such an argument in his Trumpish way…. Wilson actually means much more than that, but like the vast majority of English speaking/reading humans, comprehends metaphorical summaries and doesn’t get all hung up on semantics twisted to mean things the speaker/writer never meant. 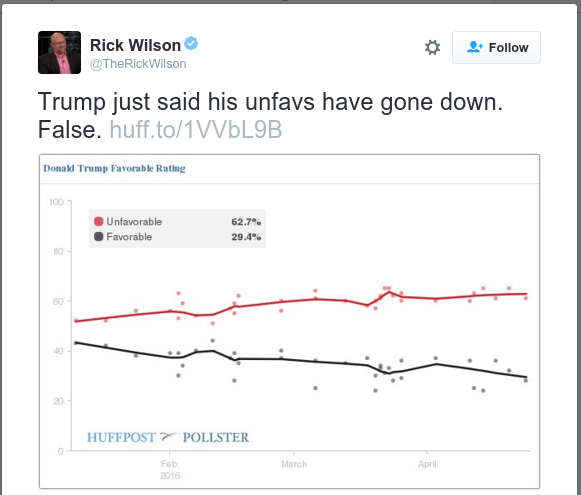 Or, put succinctly, Wilson was referring to the Huff Post Trump Unfavorability Rating, which, again, is a contrived point measure. One can go to the Huff Post website and scroll over the individual polls points to see the number, and, one can scroll along the line and discover that the “line” doesn’t really exist — only discrete calculated points are presented as one scrolls along. And one finds that that number — the specific rating referred to — was unchanged. I.E., Trump says his “unfavorability rating” –that Huff Post calculation which appears to be a moving average of some sort — went down and Wilson points out it did not. Wilson is correct. Trump (if he made the claim) was juxtaposing one specific Huff Post poll result for a subsequent one as being the “rating” when it is the average that is the “rating.” That’s a different switcheroo. Briggs claims Wilson committed the sin of reification by using a trend line, failing to recognize or acknowledge that it IS very discrete points on that trend line that constitute the very “rating” to which Wilson (and presumably Trump) referred. Wilson merely pointed out that, per Huff Post’s rating, there was no change in the RATING (the average point measures Huff Post presents) — that is factually correct. Had Briggs paid attention to the relevant details (rather than semantics) he would have bemoaned how much meaning one ought to, or not, attribute to the Huff Post rating). Not Wilson’s reference to it. you rail against reification, but believe that virgins, messiahs, miracles, life-after death, time, space, and causes exist…. irony much??? Good grief was that a lot of words to say you agree that the measured data points are not the model (which includes the idea of some “running mean” or whatever). You have made what we call a non sequitur. Which isn’t always easy. So congratulations. I was gonna add, “If that’s true then we’re all f****d,” but I don’t think I’d better. Ah, a slight cultural difference. We English insert modifiers like “appears” to avoid being, or appearing dogmatic, something less troubling to Americans. Apparently. acricketchirps: Yes, virgins exist, though you may need to drop down to 7 or 8 year olds in order to find any large quantity of them. I had a math professor that jokingly warned us students that the only thing more risky that extrapolation was predicting the future. Of course the so called climate scientists have never paid any attention to that warning. I originally had only one but since you insist here are three: Blech! Yadda Yadda. The first is not the Yiddish word. At some point one wants to talk about generalizations of the data being presented without worrying about whether these generalizations have any predictive value. Any of the generalizations might be used for prediction. However, without these generalizations we are left with a list of data and a big So What? There is indeed a trend (one side being generally lower or higher than the other) here. One only needs to blur one’s eyes (a type of averaging) to see it. The trend may be unimportant but the simplest model is a continuation of a trend. It’s the future and not the past which is important. So, yeah, there is implicit prediction present. It’s clear that Trump’s unfavs have risen (if we can trust the data) while his favs have fallen. What this means is anyone’s guess but I don’t read any Reification into this trend observation. I regard most of these poll “statistics” as nothing more than a sales gimmick; an attempt to cajole mindless mob-followers that there is a “trend” that the democratically aware should regard as some kind of expression of an evolving “truth”. The really revolting bit is that it blardywell works for the most part. Forget D’ Trump monster and all the other similar political trickster monsters:- there are much more perverse and dogmatic “scientific” superstitions that rationalise and justify all socio-political perversity. I would also like to take issue with the insinuation (by subtle scoffing at reification) that a metaphysical thing does not exist simply because it cannot be empirically examined or measured with physical tools. It implies that Life (or power to organise the physical), Truth (with the intellect to comprehend it) and Will (the capacity to desire some good) do not really exist; are not of reality. My aversion to mathemagicians and empiricists increases daily. Look at the data! … They were up one survey period before, and they went down in the last one. I bet you $500 that Rick Wilson would agree with the above. Seriously, $500. I am not a wellcher. The more formal math or statistics education a person has, or the more they’ve seen modern graphs, the more difficult it is for them to comprehend the Sin. The contrapositive of the above non-evidentiary claim is: the less difficult it is for a person (including you, Mr. Briggs) to comprehend the Sin, the less formal math and statistics education the person has, and the less the person has seen modern graphs. Hmmm…. So, I’d like to recommend you to check out some books on modern visual statistics. Gotta to keep up to date with new developments in statistics. Color maps convinced Michael Mann (hockey stick guy) that global warming was a huge threat. Maybe physicists and mathematicians should study more psychology and apply it to their own behaviours (instead of projecting pop science on others). Graphs are a wonderful way of slanting data in any direction one wants. I’m surprised psychics haven’t started using this method (some may have—don’t know for sure). This is the an excellent point. The non-material, or rather spiritual, cannot be measured but exists. But that isn’t what the Sin is. There is not one underlying cause of these points, and the same is true for many graphs. If there was one underlying “mood”, say, of the demos then some kind of smoothing or model might uncover it. But there are many individual moods and this is some sort of composite. Every individual answering has his own set of reasons for answering. How many are the same? We can’t tell. And even if we could, it is still the case the data points are real. And look at the images page. I didn’t sort through, but I saw several Sins. Almost a good anti-example of the philosophical premise “the law of non-contradiction”. Also almost a good anti-example of “a self-evident truth” in which the only alternative to a proposition is its contrary which is self-contradictory and thus absurd. All stuff that mathemagicians and verbose “philosophers” seek to bury in a tsunami of symbols, equations and words. But that isn’t what the Sin is. Orrite, Will/Matt or whatever your preferred name is. I think you should be careful not to depreciate the notion of sin by using the term capriciously. Sin is the knowing/willing violation of the order and purpose of Creation.